Well, I have just enjoyed one of the best birthday celebrations! I pretty much celebrated for a week, but, hey, at this age, I think that's pretty much okay. I just wanted to share bits and pieces of my #66 with you. 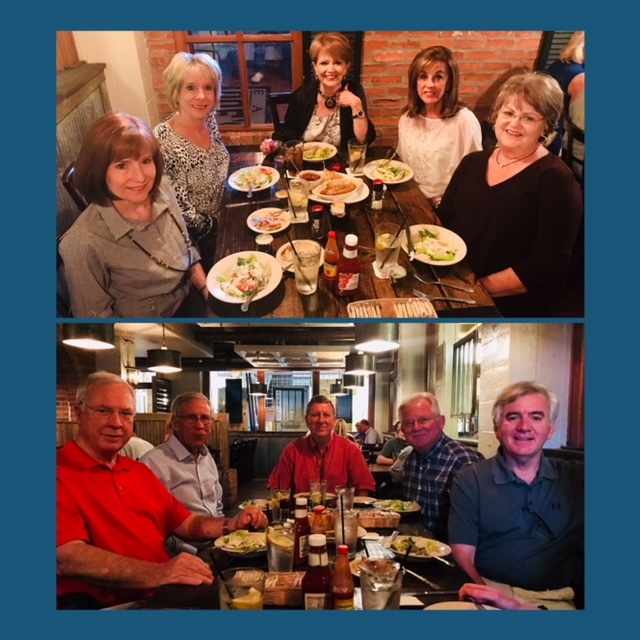 It all started with a lovely dinner at one of our favorite restaurants with dear friends. I received so many lovely gifts and remembrances and one extra special one came from my blogging friend Andrea. It was such a wonderful surprise and she sent me "all things lemon." You can check out Andrea's blog, Living on Cloud Nine, here. She's a real sweetheart! I also received a boatload of wonderful cards from friends and family. My "day" started with breakfast at Cracker Barrel. We had gone to Little Rock, AR the day before as we were in route to Oklahoma. I generally love Cracker Barrel but breakfast that morning was just not all that good. I was a tad disappointed as it was the beginning of MY birthday. But, it was just the beginning and the day held all kinds of wonderfulness later on. 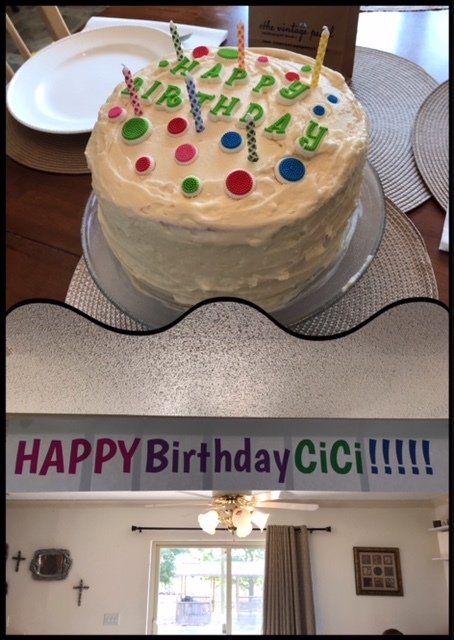 We arrived at our daughter's mid-afternoon and when we walked in she had a big banner and a pretty birthday cake. I felt so special and so celebrated. Clancy and Coleman were so excited about giving me their gift so that was done before my birthday dinner. It was the lovely personalized bracelet that you see above. My grandmother name with the birth stones of the grandchildren. Two of the grandchildren have the same birth month so it worked out perfectly to have the 3 stones placed evenly among the 4 letters. I love it!!! After a delicious dinner it was time to blow out the candles and cut the cake. 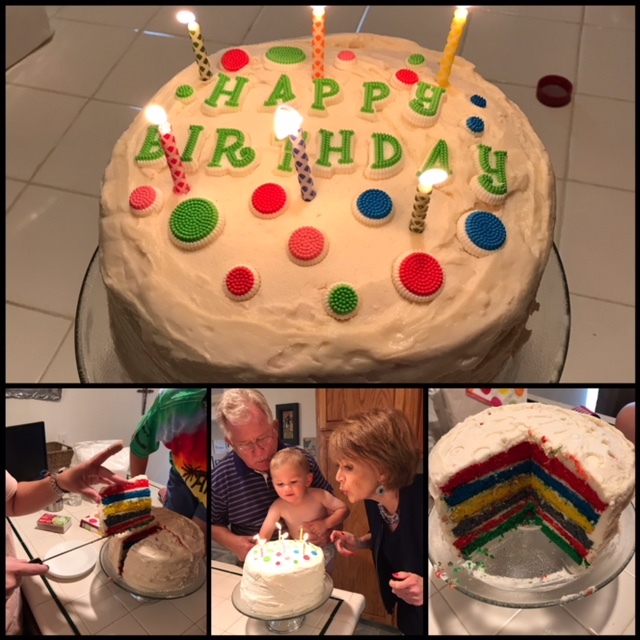 Of course, I was shocked when I saw all the colorful layers of the cake and I was quite impressed. And, when I tasted it, I was more than impressed. It was absolutely delicious!!! Bridget had put her best foot forward in creating this masterpiece. The base of the cake is the white super moist boxed cake mix and it is true to it's name, super moist. I am now anxious to try my hand at creating one of these. Bridget said it isn't necessarily hard, just time consuming. Needless to say, I felt more than a little celebrated! After the celebration we all headed outside to watch Clancy work his sheep. He just got his sheep a couple of weeks ago so they are still quite stubborn and haven't really figured out who is in charge. But, it won't be long until Clancy will have the upper hand. ~smile~ It's such a great way for him to learn responsibility and commitment. It's hard to believe this sweet boy will be 10 years old in Oct. Okay, this wraps up Part 1 of my birthday celebration. Stay tuned for Part 2, on Friday, when I recap mine and Bridget's trip to Pawhuska, Ok to do "all things Pioneer Woman." Let me just say, it was "all that and a bag of chips." I can't wait to share it with you. Of course you should have a week to celebrate your birthday! And in all honesty, I take the whole MONTH! Ha! What a special cake and presents! Glad you had a wonderful trip and can't wait to read about Part 2 on Friday! There is nothing better than to spend a birthday with family and friends. Exactly the way it should be! And as usual, your family and friends make it a very special day for you. Love the bracelet and Coleman's excited expression as he waits for you to see it. Looking forward to reading more Friday. Wishing you a belated 66th birthday, Lea! That cake looks fabulous too! WOWOWOWOW! Look at that cake! I'm counting 6 layers?? That's terrific! And Clancy with his new sheep. He's got experience under his belt (I remember last year's story), and I know he will show the sheep who's the boss in no time! I does indeed look like you had a wonderful birthday! 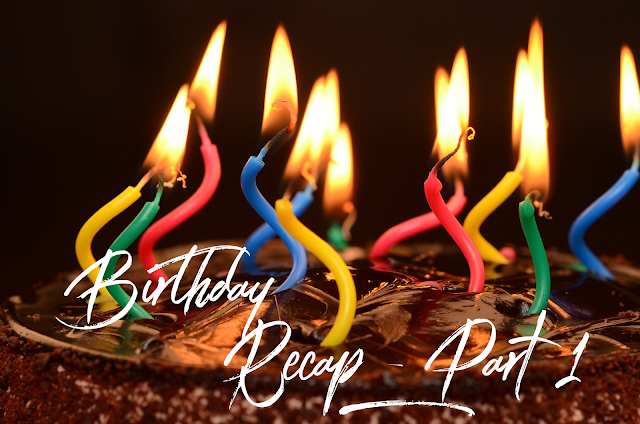 The bracelet from your grands is absolutely perfect...and that cake! How lovely. It is quite evident they love their CiCi very much! 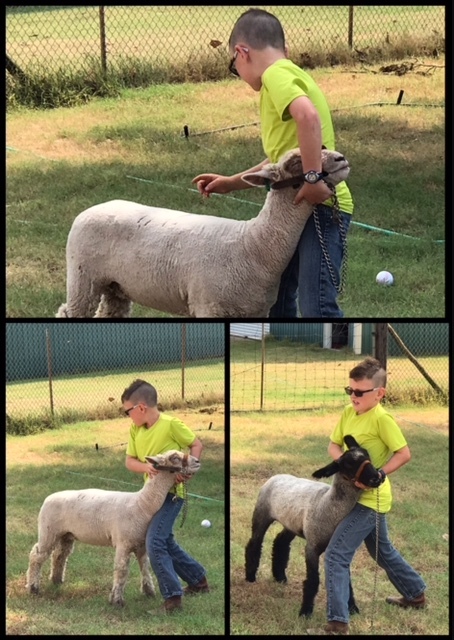 I just love any kind of farm animal and I am quite impressed with Clancy and his sheep...what a great activity! Blessings! That's the way to do it up right! That cake seriously made me drool:) Looks like you had the best birthday ever! Enjoy your day dear friend, can't wait for part 2! HUGS! As you know I'm a fan of an extended celebration : ) That cake looks delicious and the bracelet is lovely! I am all about Part 2 so can't wait to hear the details! Happy birthday!